Continue celebrating decorative gourd season with Chicago most eclectic monthly reading series! Our 110th episode on Tuesday, November 7 is a blockbuster, featuring Parneshia Jones, Henri Harps, Jeff Ruby, Gint Aras and Britt Julious! Andrew Huff and Eden Robins cohost. Admission is free, but you must be 21 to attend. Doors open at 7 p.m. sharp (don’t dawdle if you want a seat!) and the show will start at 7:30 p.m. Please RSVP on Facebook — and if you haven’t yet, please like the Tuesday Funk page so you get announcements right in your stream. 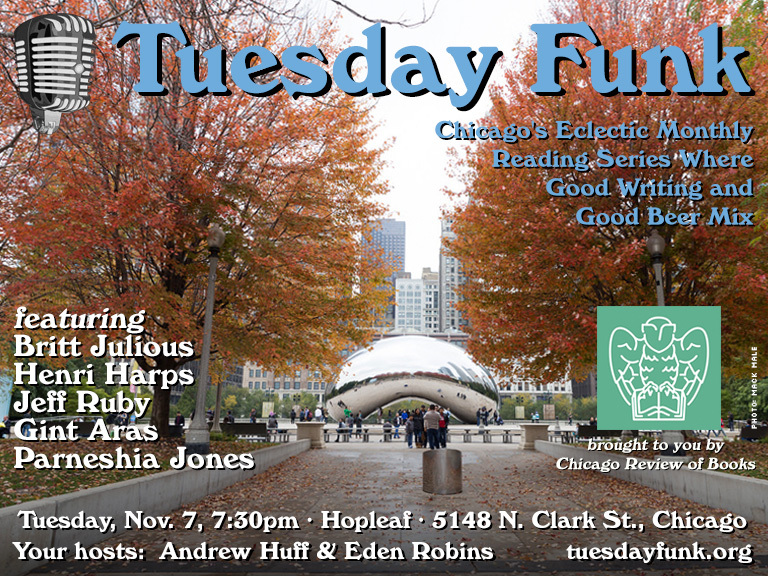 Chicago's eclectic monthly reading series, Tuesday Funk occurs on the first Tuesday of every month in the upstairs lounge at Hopleaf in Andersonville. More info may be found at tuesdayfunk.org.